Niti cemo se pokoriti, niti ukloniti! In 1887, on the occasion of the celebration of Vidovdan (Saint Vitus' Day) in the Serbian Monastery of Ravanica, Nikanor, the bishop of Pakrac, addressed his flock with these words: "I shall not make a long sermon. It is enough to tell you: Brethren, today is Vidovdan!" For Serbs, scattered over the central, northern, and western Balkans, living in 2 independent Serbian states born through revolutions and wars during the 19th century, as well as subjected to the Ottoman and Habsburg rule, Vidovdan embodied their "historical memory." It became synonymous for the 1389 Battle of Kosovo, which took place on that day, and which determined the Serbian people's collective and individual destiny. Vidovdan was imbedded in the Serbian ethnic and national self-awareness. It became the incentive for survival, the inspiration in the struggle for personal and national liberation. The myth and legend of Kosovo and Vidovdan were transmitted to posterity by the popular epic poetry, by the Serbian Orthodox Church, by intellectuals and historians, as well as by national and political leaders in modern times. Generations of Serbs and historians divided the national past into 2 periods: before and after the Kosovo Battle. Later, following the birth and ascendancy of the modern Serbian state in the 19th and 20th centuries, 3 kinds of traditions emerged: the old cult of the Kosovo Battle, the reverence for the 1804-1815 uprisings, and the commemoration of the 1912-1918 wars. The first marked the defeat of the medieval Serbian state, the second announced the beginning and the third the victory of the reborn state. Among Serbian national holidays, Vidovdan occupied a place of particular importance. It symbolized the death and resurrection, the despair and hope, and the end of an epoch and the beginning of a new era. During the Ottoman rule, it offered a fatherland even before it was organized. It was woven in the texture of modern Serbian nationalism in recent times. In 1889, in agreement with religious authorities, the Serbian government confirmed Vidovdan as the day consecrated to all those who sacrificed their lives for the faith and the fatherland. Intentionally, or by historical coincidence, on Vidovdan 1876 the war against the Ottomans was declared, the 1881 Secret Convention with Austria-Hungary was signed, the 1914 Sarajevo assassination took place, the 1921 Yugoslav Constitution was proclaimed, and the 1948 Resolution of the Cominform was declared. Until the end of World War II, Vidovdan marked the end of the school year when awards were bestowed upon the best students. Reference to the past characterized the development of modern nationalism in Europe during the "age of national renaissance" after 1815. In the search for the "national soul" the celebration of the days of fallen heroes was to confirm the national identity and unity. In the study of the cult of St. Vitus' Day among the Serbs my esteemed colleague and old friend, Professor Ekmecic from Sarajevo, compared this observance with the "Fete de la Federation" inaugurated in 1790 in France as a token of the "united and indivisible nation," practically as in the same manner as Bastille Day or the "Totenfest" introduced by Wilhelm III in Prussia. The celebration of Vidovdan among the Serbs expressed, in general terms, similar trends of modern nationalism. But, at the same time, there was 1 difference. Days celebrating fallen heroes were in Europe decreed from above, by rulers or governments. Vidovdan truly emerged among the Serbs from the grassroots, from the illiterate village community. Until officially celebrated, it already existed in the people's minds, in oral history, refreshed and adapted in epic ballads as a part of the folk tradition. This tradition was spread by Serbian migrations over the regions in which they settled during the Ottoman period. At the beginning, it contributed to the feelings of ethnic unity of the Serbs and, later, to their affiliation with their modern nation. From the day of their conversion to Christianity the South Slavs celebrated St. Vitus' Day, dedicated to an Italian saint from Lucania. The conservative peasant community for centuries preserved customs related to the pagan god Svevid or Vid, the Slavic name for St. Vitus. According to Milan Milićević, in the 1880's peasant girls would soak the herb "vidovica" in water and wash their faces with it. 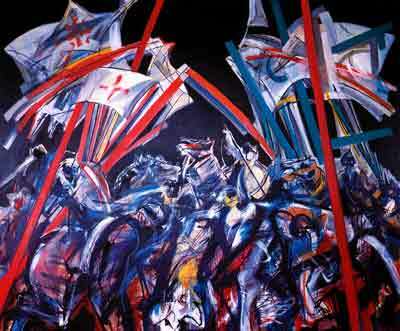 However, the Battle of Kosovo, which took place on the saint's day, gave another meaning to it. According to peasants's belief, the rivers will turn red on Vidovdan, colored by the blood of fallen heroes at Kosovo. After the battle, Kraljević Marko fell asleep to wake up on the day when Kosovo will be avenged. In Montenegro women wore black scarves around their heads and the men's caps were embroidered with black for mourning the Vidovdan Kosovo Battle. 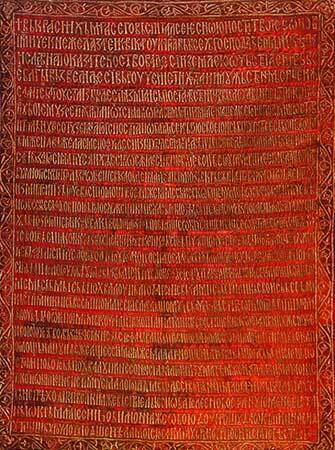 At the beginning of the 19th century, the Serbian Church marked Vidovdan with red letters in religious calendars. Seeded in the people's mind through being chanted by peasant bards, whose poems Vuk Karadzic collected, the Vidovdan message was further modified and adapted to contemporary needs of the modern epoch. Historians and intellectuals referred to the cult of Vidovdan in transforming the instinctive popular national feelings into modern, mass nationalism. Supported by the Church, the leaders of the gradually developing Serbian statehood in the 19th century offered their support to the Vidovdan legacy. Although Karađorđe appeared in the popular mind as the avenger of Kosovo, the leadership of the 1804 Serbian uprising extolled the medieval state tradition and the cult of Stefan, the First Crowned King. It symbolized the ascendancy of statehood, while Kosovo meant its collapse. The tragic defeat suffered in 1813 invigorated the memory of the sacrifice of 2 central figures of the Vidovdan myth: the martyrdom of Prince Lazar and the heroic regicide of Miloš Obilić. During the reign of the Obrenovići (1815-1842), the accent was placed on the 1815 uprising, while the cult of the previous 1804-1813 movement was deliberately neglected. Along with the further consolidation and organization of the Serbian state, as well as through the extension of the Serbian national program, the legacy of Emperor Dušan the Mighty was brought into focus. Garašanin's Načertanije, written in 1844, quoted the crucial effects of the Kosovo Battle, but found the country's future in the restoration of the pre-Kosovo Serbian state tradition. Both Serbian dynasties, the Obrenovići and Karađorđevići, presented themselves as heirs and successors of medieval rulers. The later organized political parties, during the last decades of the century, modified the Vidovdan message according to their ideological and political polarizations. The conservatives remembered Prince Lazar's oath on the eve of Vidovdan, which called for unity. Domestic political dissent caused, according to them, the 1389 defeat. On the contrary, the liberals referred to the democratic resistance of the people, to the message of the Mother Jugović and the servant Goluban, and the popular struggle for freedom. Whatever the pragmatic approach to the Kosovo message might be, Vidovdan continued to be commemorated by the public at large. As a writer from Vojvodina described its influence, "... the cult of Kosovo heroes was presented to children at Christmas, at the slava, and was quoted in proverbs and curses." The Church took the leading role in organizing Vidovdan commemorations during the first decades of the century. Ecclesiastical calendars presented Vidovdan as the "Emperor Lazar's Day," mentioning St. Vitus only additionally. Vidovdan was dedicated to the day of "national grievance and repentance." Vidovdan was considered in general as the day of national mourning. Later on, during the last decades of the century, the churches were on Vidovdan draped in black, black flags were put out on houses, national standards were at half-mast, and invitations for the commemoration were printed with black margins. The cult of Vidovdan blossomed during the period of romanticism in the 1850's and 1860's. Formed in 1847, the Society of Serbian Youth chose Vidovdan for the founding day when "our heroic forefathers sacrificed themselves for freedom." A founding member made the inflammatory appeal: "Do we will, can we, do we dare to go to Kosovo!" Historians of the romanticist school idealized the past. Portraits of Kosovo warriors were reproduced and displayed in peasant and urban homes. Vidovdan became the major topic in literature, dramatic arts, and paintings. Student associations glorified the sacrifice of their ancestors, which culminated in the national euphoria of the Omladina in the 1870's. While the Church, the youth, and the nationalistic public were commemorating Vidovdan, the state authorities were forced to take a cautious attitude. Until 1878, Serbia was in a vassal relationship with the Ottoman Empire. The international status of Serbia was fragile, which was manifested during the Crimean War, national upheavals during the 1860's, and the eruption of the Eastern Crisis in 1875. Until 1867, Turkish nizams were still patrolling the streets of Belgrade, while the pasha was residing in the city's fortress. Serbian governments were involved in underground revolutionary activities aiming toward the liberation and unification of Serbs then under Habsburg and Ottoman rule. However, to openly and officially organize celebrations and commemorations of a battle in which the Serbs fought the Turks and 1 of their knights assassinated the sultan would be an affront to the Ottoman suzerain. The first public celebration of Vidovdan took place in the Beograd reading room in 1847. But when in 1851 state officials participated in the organization of Vidovdan festivities, the Ottomans protested vehemently and the Serbian government had to fire the incriminated officials. In 1865, when invited to write the text for the Serbian national anthem, the poet Jovan Jovanovic-Zmaj from Novi Sad was explicitly warned from Belgrade not to mention Vidovdan, in regard to the Turkish reaction. With the consolidation of the Serbian international position and the 1878 recognized independence, the situation improved, although the constant threat of Ottoman reactions was present until the 20th century. In 1882, when Serbia was proclaimed a kingdom, King Milan was named "The First Crowned King After Kosovo." In that moment references to the past were mainly used for domestic political purposes. During the 19th century, Vidovdan was commemorated among Serbs in the Habsburg and Ottoman Empires, under the watchful eye of the respective authorities, sensitive to the outburst of Serbian national feelings. The Vidovdan cult was the strongest in Vojvodina, due to the advanced Serbian community and the role which the Church played in it. Especially after the revolutionary days of 1848, Vidovdan was remembered at church gatherings, popular fairs, and youth festivals as a token of national solidarity, pride, and self-confidence. From 1869 the Orthodox calendars in Bosnia dedicated Vidovdan as the day of "Emperor Lazar, Patriarch Yephremos, and the Martyr Vitus." When the 1875 uprising started in Bosnia and Herzegovina, the call addressed to peasants to join the movement quoted almost verbatim Prince Lazar's oath on the eve of Vidovdan 1389. Vidovdan found its place in the formative stage of the Yugoslav movement in Croatia. In 1840 the day was celebrated by students of the Zagreb seminary. Danica Ilirska, the journal of the Illyrian movement, published Kosovo epic poems. Its leader, Ljudevit Gaj, wrote in 1853 a series of essays on Vidovdan. On the occasion of the 500th anniversary of the Kosovo Battle in 1889 a solemn session of the Yugoslav Academy of Sciences and Arts was held in Zagreb, with speeches by the 2 most prominent Croatian scholars: Franjo Rački and Toma Maretić. At the beginning of the 20th century, the world-famous Croatian sculptor Ivan Mestrovic designed the "Vidovdanski Hram" (St. Vitus Temple). It was never realized, although the most important figures from the Kosovo epic were already made in marble in 1908. Meštrović's artistic vision was the greatest glorification of Vidovdan ever attempted. The memory of Vidovdan was kept alive among the Serbs in the Ottoman Empire. The Orthodox seminary in Prizren, founded in 1871, became the nursery of the Vidovdan cult. The students association, "Rastko," named after St. Sava's lay name, commemorated Vidovdan in order to promote national propaganda, and was exposed to the constant pressure of the Ottoman-Albanian hostile environment. The outburst of Serbian national dynamism at the dawn of the 20th century further enlivened the cult of Vidovdan. To "avenge Kosovo" became the slogan of the day. Among the Serbian and Montenegrin war aims in the 1912 war, the priority was to reconquer and liberate Kosovo. As a result, the campaign had the character of a holy war. After the victory, students and citizens visited the Kosovo monasteries. Visits were scheduled mainly on Vidovdan to attend the solemn service in Gracanica. It was there in 1914 that a group of students from Sarajevo learned the news of the assassination of Franz Ferdinand. There is no doubt that Gavrilo Princip, planning the regicide, was greatly influenced by the aura of deity which the Bosnian nationalistic youth assigned to Miloš Obilić, as well as by Vidovdan, the day when the Austrian crown prince visited the Bosnian capital. The Vidovdan cult reappeared again during World War I, when the Serbian army retreated to Kosovo, on its exodus to the Adriatic shores. In that dramatic moment the flamboyant Vojvoda Mišić proposed a counter-offensive from Kosovo, imbued with the same Vidovdan alternative to win or to perish. Vidovdan was celebrated in British schools during the war. The 3rd detachment of volunteers from the United States embroidered on their flag "Vidovdanski borci iz Amerike," and a group of volunteers on the Salonika front took the name "Vidovdanski borci." During the century from 1889 until 1989, celebrations of centenaries of the Kosovo Battle mirrored the spirit of the people and the needs of the times in which they lived. In 1889, on the occasion of the 500th anniversary commemoration, Serbia was facing the crisis caused by the domestic struggle for constitutionalism and parliamentarism, the victory of liberalism enacted by the 1888 Constitution, followed by the abdication of King Milan and the succession to the throne of his minor son, Alexander. The popular and official celebration of Vidovdan 1889 had, besides the national cause, the desire to consolidate the shaken dynasty and to strengthen the new liberal regime. On Vidovdan, June 15th (by the old calendar) a solemn requiem to the Kosovo warriors was held in Kruševac, the ancient capital of Prince Lazar, and the foundation of the monument dedicated to the Kosovo martyrs was laid. In the following days the young King Alexander was anointed in the Žiča Monastery as "the first anointed Serbian king after Kosovo." The anniversary was celebrated in Montenegro, Vojvodina, and other parts where Serbs lived. In 1939, 50 years later, the 550th anniversary of Vidovdan was commemorated in the atmosphere of the coming crisis and under the stormy clouds which announced to Europe the outbreak of World War II. Requiems of Vidovdan in Gracanica, both Monasteries of Ravanica in Resava and Srem, as well as the 2 Lazarica Churches in Kruševac and Dalmatia, were held in the presence of the representatives of the government and the army, the military, and national societies. They delivered the message to the expected invader: "Niti ćemo se pokoriti, niti ukloniti!" (We shall neither submit, nor yield!). The Serbian people, faithful to their historical legacy, paid dearly for this commitment during the World War II. Under the new Communist regime imposed after the end of the war, public and official commemorations of Vidovdan were not allowed, and the Vidovdan memory was intentionally swept under the carpet. The only organization which kept it alive for more than 40 years was the Serbian Orthodox Church. However, the destruction of the historical legacy proved to be an illusion. The national revival of the Serbs, subjected to an artificial "national symmetry" in the Yugoslav multinational state, which divided them and deprived them of authority over their own territory, erupted like a volcano in recent years. The Vidovdan message became resurrected as a cornerstone in Serbian history. As happened in centuries past, the cults of St. Sava and Kosovo became again the cement to unify the nation in the struggle for national and human rights. On the eve of Vidovdan 1989 the splendid, new Church of Saint Sava was consecrated in Belgrade, and the next day over one-and-a-half million Serbs from all over the country attended the 600 years requiem to the Kosovo martyrs in Gracanica, as well as the official ceremony in Gazimestan, where the 1389 Battle took place. Popular gatherings in Romanija (Bosnia) and Knin (Croatia) followed. Scholarly symposia in Belgrade, Sarajevo, and other places dealt with the historical importance of the 1389 Battle for the Serbs, Yugoslavs, the Balkans, and Europe. The historical heritage has a double meaning: that of fiction and that of reality. It mirrors the past and projects the future. The Vidovdan message was and is for the Serbs, wherever they live, a token of their past and present destinies. The Eulogy of Nun Euphemia to Prince Lazar - embroidery, beg. 15th c.